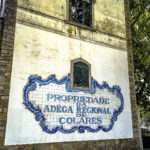 One of the first photos I took in Colares three summers ago captured classical letters spelling out the “Adega Regional de Colares” in azulejos along the side of a long white warehouse shaded by plane trees in the heart of Varzea de Colares. 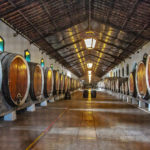 Those thick walls shelter two vanishing rows of tons fashioned from Brazilian wood, where wine has aged and developed for nearly 90 years. 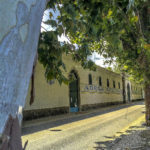 The Adega Regional de Colares hosts much of the history of wines in the Colares DOC, which hugs the coast in the shadow of the Serra da Sintra north of Lisboa. 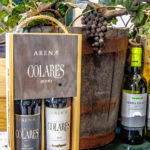 In the late 1800s, Colares gained notoriety for its vines surviving the phylloxera crisis. 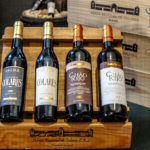 Prior to 1931, the wines of Colares were produced haphazardly, with enterprising privateers buying grapes from around Portugal to slap them with the Colares label. Something had to be done to preserve the region’s reputation. 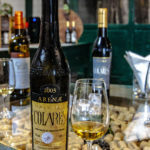 So, in 1931, the Adega Regional de Colares was established, formulating the core of the DOC—no other wines could be labeled “Colares” from that point on into recent decades. In 1934, a consortium of growers purchased the Adega, turning it into a true cooperativa, which held fast on the DOC wines until 1994. 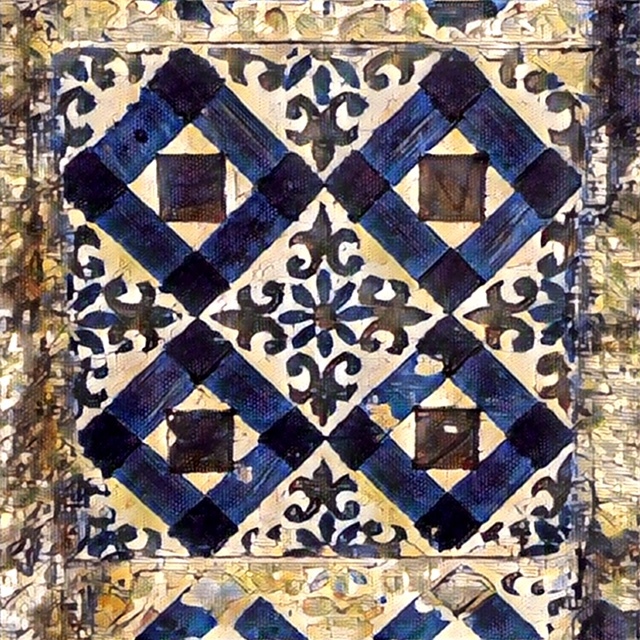 Even if a wine carried a different vintner’s name, it had to be produced at the Adega. 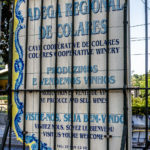 A version of this holds true today—though the requirement to produce all Colares wine here has ceased, the Adega makes wines under contract for many small growers and winemakers in the area. 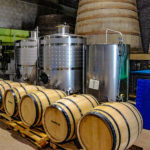 With a capacity of 700,000 liters, the Adega can take on quantities of wine outside of the roughly 25,000 bottles it crafts of its proprietary brands. On our most recent visit, at the end of August 2018, manager Francisco Figueiredo waited for the delivery of the first of the 2018 harvest from one of those contracts—a Pinot Noir. Figueiredo takes his role as Colares’ shepherd seriously. He came to the Adega first in 1999, becoming assistant to the winemaker in 2001, and joining full time in 2002. 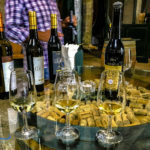 An agricultural engineer by his initial schooling, he completed a rigorous five-year postgraduate course in winemaking in Porto. 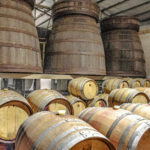 Now he presides over the Adega’s operations, which, on our latest visit, included hydrating refurbished French oak barrels with water in advance of harvest. This year, Figueiredo expects recolta a couple of weeks later than last year, with most of the harvest stretching into mid October. Past acceptance and crush, the grapes will then travel into fermentation tanks based on their color and final disposition: stainless steel for the whites, and imposing, open-topped chestnut tanks from the 1960s and 1970s that parade up the center of the manufacturing building. 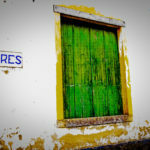 The structure also houses the original lagares, though little foot stomping remains in play at the Adega right now. 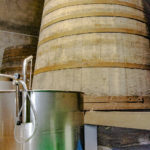 But the old foudres nurture the grape’s brew with natural yeasts to create an atmosphere preserving the time-honored ways of the cooperativa. 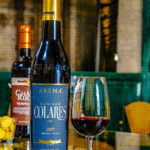 The Adega bottles two primary lines of wine, the DOC Colares Arenæ red and white, and the VR Lisboa Chão Rijo. 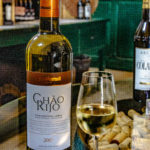 Only the Ramisco and Malvasia grapes grown on sand can go into the DOC wines; greater latitude (and a lower price point) comes with the Chão Rijo wines. The phrase chão rijo means “hard soil,” literally referring to the clay-based soils in the region, as opposed to the “soft” sand. 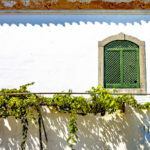 The Adega also makes a value wine, Serra da Lua, which goes for less than €2 a bottle—or about €8 per 5-liter box, in tinto, branco, and rosé blends. Over three years, we’ve consumed our fair share of all the Adega’s wines—and their consistent quality has kept us returning to them for our house wines. 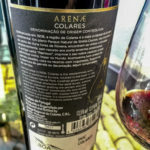 A note on the bottles: Like other producers in the DOC, the Adega Regional de Colares has bottled its wines in a varying formats over the years. At one time, 600ml bottles, and even 650ml bottles were made, with a period in more recent years of the more standard 750ml bottles. 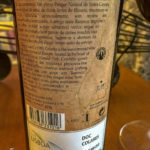 But in an effort to maintain pricing per bottle with a sharply limited supply, the Adega currently bottles its DOC wines in 500ml bottles with a unique shape. The other wines come in the familiar 750ml size. We share with you our notes from two tastings, a year apart, so that you can compare a handful of vintages. Check with the Adega to confirm the availability of any wines. With only 50 acres under vine in the region, the supply’s often limited—though Figueiredo notes that, with the increased attention to the DOC, landowners have planted more vines in recent years, stemming the loss of the precious terreno. What wonderful news, indeed. 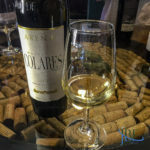 From 100% Malvasia de Colares grapes, the 2014 vintage shows lanolin and lemon on the nose, with an acid streak over its layered marine elements. Spicy lemon pith on the palate, and echoes of the umbrella pines. From 100% Ramisco grapes, the 2008 vintage was aged for five and a half years in the Brazilian tons, then for one year in smaller barrels. With a garam masala nose, the structured wine shows dried currants and medium tannins. From a blend of Fernão Pires, Jampal, Golego Dorado, and Malvasia grapes, this bright white shows a floral nose, plus citrus on the palate. A versatile wine to go with seafood and petiscos. From a blend of Castelão and Tinta Roriz grapes, this medium-bodied red smells of bright red roses, and tastes of blackberry confiture. Medium tannins in a good place, smooth. 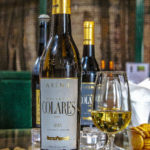 From 100% Malvasia de Colares grapes, the 2015 vintage has a scent of hay along with honeysuckle and buttery biscuits. On the palate: warmed chimayo—custard apples. A special treat! Figueiredo poured us tastes of this 15-year-old DOC white from the library, and we were enchanted. The wine was a bit oxidized, but the acidity holds it together well. The aromas of honeyed almonds and flowers balance against an almost sherry-like dry finish. Impressive life at this age. 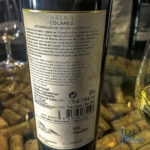 From 100% Malvasia de Colares grapes. 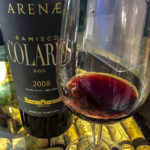 From 100% Ramisco grapes, the 2009 vintage starts with candy and brambles on the nose, with a hint of five-spice powder. A moderate acidity tells us the wine is coming into its prime drinking period. Lots of blackberries still underneath with a moderate finish. From 100% Ramisco grapes. 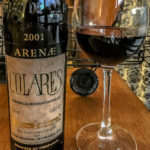 We purchased a bottle of the 2001 vintage at a local market, to sample it against more recent ones, and to see the aging potential of Ramisco in full force. It also represents one of the first vintages where Figueiredo was at the Adega—though not yet in his current role. The wine remains a deep brick red, with the trademark salinity on the nose. To taste, salted watermelon, some dried currants, but no bright fruit—all muted, with little back end left. This was marked #2,771 of 4,190 bottles produced that year in the 500ml size. 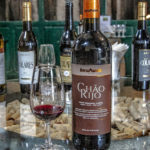 Composed of Fernão Pires, Jampal, Golego Dorado, and Malvasia (80%), the wine’s grapes grew in clay soil, mostly near São João das Lampas. Fermented in stainless steel, the wine’s aromas provide spice through the acidity, along with a mineral streak. From a blend of Castelão and Tinta Roriz grapes, this garnet-colored red shows deep plum on the nose and palate. A great everyday red for grilling and flavorful meats and sardines.